The common definition of a progress trap is derived from the print version's cover text: "..it is the condition in which we find ourselves when science, technology and industry create more problems than they can solve. Often inadvertently." Why do societies so often start off in partnership with their natural environment, making brilliant advances, only to relapse to a shadow of their former glory? Should not their brilliance prevent them from declining? Escaping the progress trap shows how societies and individuals can be their own worst enemies, often unconscious of the effects of ingenuity on their environment. When changes are man-made and harmful, an inescapable spiral can begin: development that excludes solutions to problems that arise from development. Are we wired for this kind of failure? Not really, but with the best of intentions, ingenuity often short-circuits our talent for apprehending the hazards with which we have surrounded ourselves. It upsets our natural ability to respond effectively to threats in the environment. There are many books that catalog historic pathways to collapse. This book examines the strange process of development that undermines itself, and searches for for clues in behavioral science that may explain why this happens. A leading academic publisher noted that the "work does in fact promise to provide a powerful analysis of our situation and what may be a fruitful way of resolving the dilemma which that analysis exposes." Dr. Sheila Mason, professor of Environmental Ethics with Concordia University's philosophy department observed: "two chapters ... fit in well as I like to use Damasio and Ledoux to make the point about emotion, which fits very well with Virtue Theory - the basis of this course...The writing is very beautiful: clear and measured." 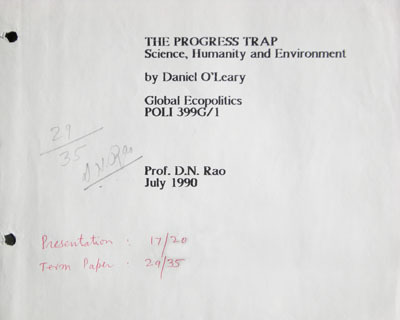 The project began life in 1990 as a presentation : "The Progress Trap - Science, Humanity and Environment". 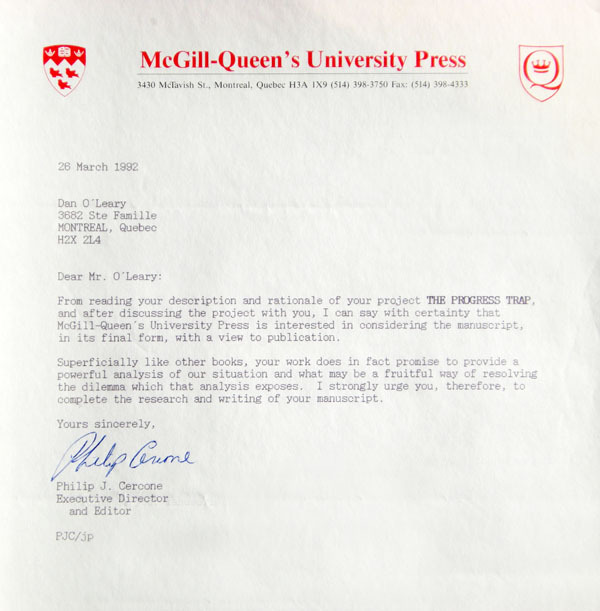 It was then accepted for development in 1992 by McGill-Queen's University Press (MQUP). 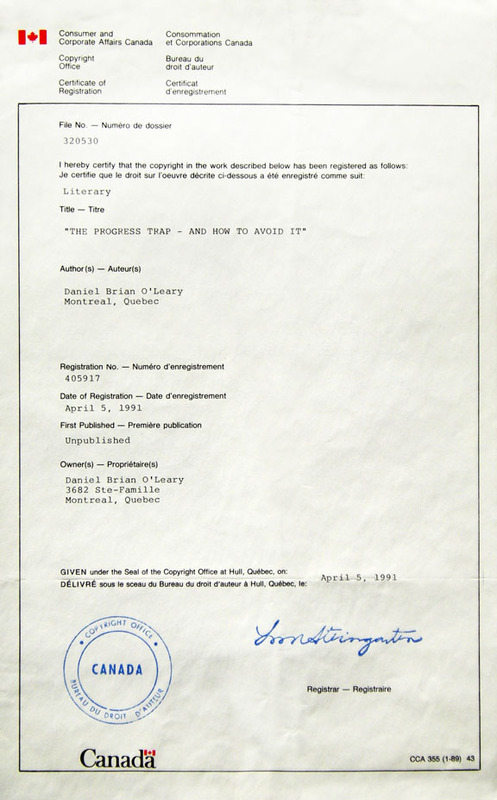 The copyright for "The Progress Trap - and how to avoid it" was registered in April 1991. The manuscript was completed and submitted in 2002, but did not see final publication at MQUP. 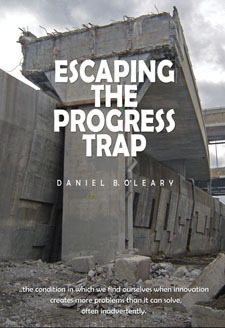 After a similar book appeared in 2004, the author decided to publish independently, with the title "Escaping the progress trap". Born in Cape Town and raised in Lesotho and Ireland, Daniel Brian O'Leary FRSA has lived in Canada since 1976. A graduate in Science and Human Affairs (Concordia 1990), Daniel has furthered his education online with Oxford, Harvard, Berkeley and MIT. Note: the research, book and website form an independent undertaking.